If you’ve ever been attacked by a bee, wasp, hornet, or any other stinging insect, then you have an idea of what a painful sting can feel like. Maybe you’ve wondered how painful an insect sting can actually be. Throughout the 1980’s, American entomologist Dr. Justin O. Schmidt intentionally enraged hundreds of stinging insects just so that he could compare the severity of their stings. Thanks to Schmidt’s work, we now have the Schmidt Pain Index, a useful tool for comparing and ranking the pain of various insect stings. According to Schmidt, the warrior wasp, tarantula hawk, bullet ant, red harvester ant, and paper wasp are the most pain-inflicting insects in the world. The Schmidt Pain Index ranks insect stings on a scale from 0 to 4. A 0 on the Schmidt index represents slight pain -- comparable to a light pinch. The 4 represents excruciating pain. The sting of the paper wasp ranks at 3.0 on the Schmidt Pain Index. 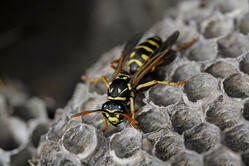 Paper wasp stings inflict a burning sensation that’s been described as the same feeling as spilling acid on your skin. A paper wasp sting may also cause a bitter taste in your mouth. Avoid wasps by wearing less perfume when you’re planning to spend time outdoors. Keep wasps off of your property by picking up fruits such as apples, pears, or plums as soon as they drop from trees: this will remove their food source from your yard. 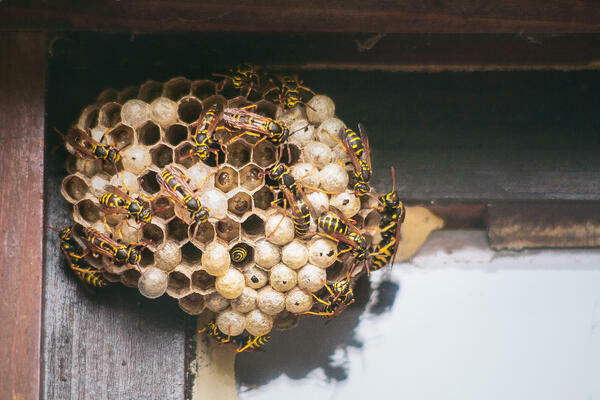 If you have a paper wasp colony on your property, call a professional. Don’t attempt to remove the nest yourself! If you experience a minor allergic reaction to a paper wasp sting, taking an oral antihistamine may help. If you’re severely allergic, seek medical help immediately. For minor irritation, holding ice to the sting may help. You’d be surprised by how much pain such a small creature can inflict! While larger than other species of ant, the red harvester ant inflicts an amount of pain that’s completely disproportionate to the size of its tiny body. The red harvester ant injects a minuscule amount of a very strong venom into your skin. This venom creates a sensation at the affected area which feels akin to having a hole bored through the upper layers of your epidermis. These ants are native to the southern United States Their nests are hard to spot, as they’re underground: these ants don’t make mounds. If you search hard enough, you may be able to find a tiny hole in the ground which is the “door” to the home of the red harvester ant. A harvester ant sting can burn and hurt for a while. For minor reactions, you can purchase some calamine or hydrocortisone lotion and apply daily according to the product’s directions to help with the irritation. If you have a serious allergic reaction to this stinging insect, contact emergency services immediately. Schmidt described the sting of this two-inch wasp as plain and simple “torture.” Warrior wasps are luckily only found in Southern and Central America. Contact a medical professional if you experience a warrior wasp sting while on vacation. 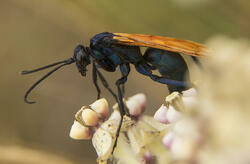 The tarantula hawk is one of the most pain-inflicting insects on the planet. This sting ranks as a 4.0 on the Schmidt Index. The tarantula hawk is in fact a 2 inch long wasp that lives in desert regions of the United States and some other countries. Its name comes from its particular appetite for tarantula blood. The enormous 7 mm venom-filled stinger of a tarantula hawk is enough to paralyze an adult tarantula. While it won’t paralyze a person, the resulting pain earns this insect the title of the world’s second most painful stinging pest. In the United States, you’ll only find the tarantula hawk in desert regions. You can spot them by their dark body contrasted with bright and attractive wings. These wasps aren’t particularly aggressive towards humans, as they’re much more interested in tarantulas. They’ll only sting if their nest is disturbed or they’re seriously provoked. If you notice a tarantula hawk, keep your distance. Possibly the most dangerous stinging insect on earth, the bullet ant sting causes extreme pain which ranks at 4.0+ on the Schmidt Index. Even a person who’s experienced some of the most painful stings in the world may find that they can’t handle the throbbing and burning sensations caused by the bullet ant. This stinging pest goes by many names, including the conga ant, the 24-hour ant, and the giant hunting ant. The commonly used name “bullet ant” describes the feeling of the sting -- it’s as if a bullet has pierced your skin. This intense pain may last as long as 24 hours. 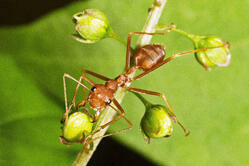 It’s hard to imagine, but bullet ants are used in a male initiation rite in some parts of Brazil. The ceremony involves filling an enclosed glove with bullet ants. A young man places his hand into the glove and keeps it there for 10 minutes, forced to endure the pain of the stinging ants. Thankfully, bullet ants aren’t found outside of South and Central America. If you have the misfortune of receiving multiple bullet ant stings, we recommend seeking medical attention right away. Unless you experience an allergic reaction, you may not need to take a trip to the doctor after one sting. The most extreme pain will last for a few minutes. After washing the sting, apply a baking soda paste to the area to reduce inflammation. You can also use ice packs to numb the spot as best you can. If in doubt, contact a medical professional. Protecting your home from stinging insects is a job for seasoned and knowledgeable professionals. At Home Pest Control, we use our expertise and knowledge to both eliminate and prevent pests in and around your yard. Get in touch with us for a stinging insect consultation. Want to learn more about stinging insects? Check out our free, easy-to-read stinging insect guide here! Tips to Soothe and Calm Your Skin after a Sting Bumble bees, honey bees, wasps and hornets: what do they all have in common?